Spean Bridge. View of bridge. 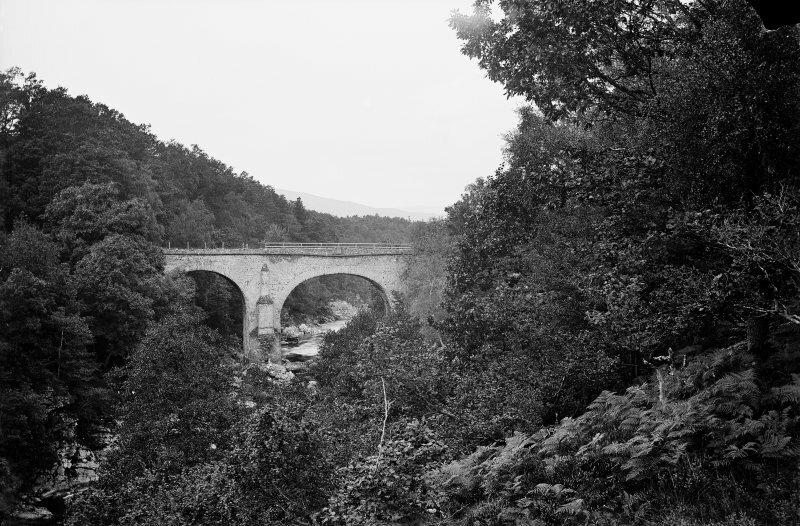 High Bridge near Brackletter, General Wade, 1735-6 The remnants of this daring and remarkable structure remain a thrilling spectacle, riding high above a narrow gorge flushed by the fluctuating waters of the Spean. A section of cast-iron footbridge (introduced c.1894) balances precariously over the chasm on soaring stanchions with triangular cutwaters, the old military road approaching it over massive buttressed abutments. The bridge was 'in a perilous state' in 1819; it was repaired in 1893. Not to be confused with Spean Bridge (over River Spean, in Spean Bridge village), for which see NN28SW 15. OS 1:10,000 map, [no date available]. REFERENCE - Photographs: National Library of Scotland; Nattes Drawings. 20 Sept. Vol IV no 61. Drawings of High Bridge over the Speyan 8 miles from Fort William. High Bridge was built by General Wade in 1736 (see NN28SW 7). By the 1930's one of its 3 arches was broken and by 1979 only one survived. Visited by OS May 1970; February 1979. 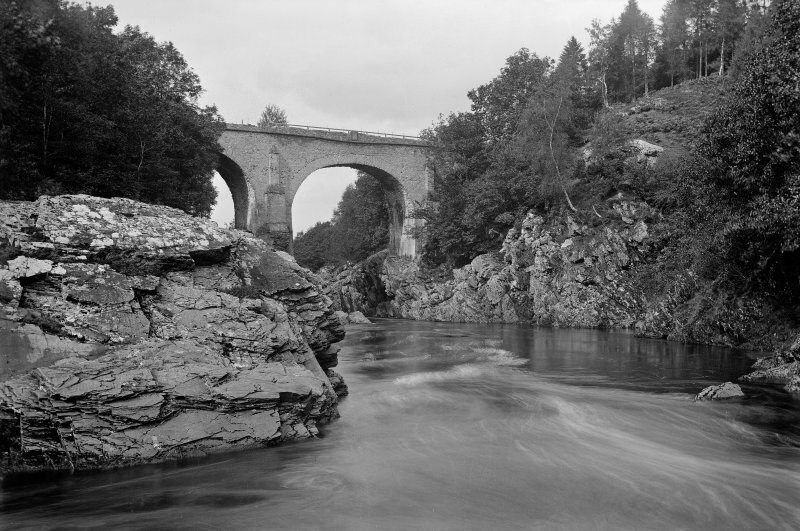 This constitutes the remains of a triple arch stone bridge, known as High Bridge, which was completed in 1736. There is complete disintegration of one arch and the remainder of the bridge is threatened with imminent collapse. Although an iron truss has been positioned across the top of the bridge, it does not appear to furnish any support. M Logie (Highland Council) 1997; NMRS MS 1007/3. This bridge carries the line of the Wade Road MR1 over the River Spean about 2.2km WNW of Spean Bridge village (NN28SW 16). The location assigned to this record defines the centre of the structure. The available map evidence suggests that it extends from NN c. 20046 82096 to NN c. 20070 82114. Information from RCAHMS (RJCM), 12 April 2006. High 3 arched rubble bridge; segmental headed dressed rubble arch rings; triangular cutwaters rising as stepped buttresses at each end abutments. Smaller east bank arch survives; section remains of cast-iron footbridge placed over missing spans, now also collapsed. Fragments of pulvinated string course survive. Built by General George Wade [when building roads, barracks and bridges in Scotland in the aftermath of the Jacobite Rebellion of 1715 as 'Commander in Chief of his Majesty's forces, castle, forts and barracks in North Britain', appointed 1725]. and the truss is still in place. W and upper parts of the bridge had been washed away. However, enough masonry survived to allow the form and size of the lower parts of the bridge to be understood. The bridge was 5.2m wide (from parapet to parapet), with a 1.2m span and was carried over the burn on a vault, the lowest parts of which survive in situ to the SE. The bridge was constructed with a lime-bonded rubble face that retained an unbonded rubble fill.